* Legacy Product: Available, but Not Recommended for new designs. The ultra-compact UC1394a-1 is a ready to use embedded FireWire peripheral interface devices for integrating digital hardware, such as cameras, sensors, and other embedded devices, within a high performance FireWire networking environment. It is implemented as a 116 pin PLCC surface mount multi-chip module, which measures only 30mm x 36mm. On-board DSP, FPGA and a wide variety of serial, analog, and configurable digital I/O resources provide the developer with an extensive range of plug & play and software programmable capabilities for IEEE 1394 FireWire connectivity, embedded peripheral control, and signal processing applications. 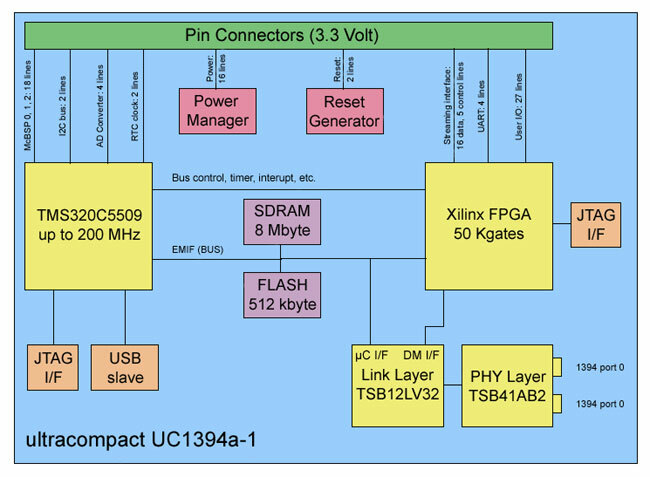 Key functional resources within the UC1394a-1 include a TMS320C5509A DSP, a Xilinx Spartan-II 50kGate FPGA, TSB12LV32 Link Layer and TSB41AB2 Physical Layer [IEEE 1394a] controllers. 8MBytes of SDRAM and 512kBytes of FLASH ROM provides program and data storage for the DSP and FPGA. Two 400MBit/s IEEE 1394a ports are provided, together with a wide variety of universal interfaces to enable integration with a hardware design. These include a 32MByte/s 16-bit wide plug & play data streaming interface, RS-232, USB, McBSP, I2C, JTAG, integral analog to digital conversion for four analog inputs, and user configurable digital I/O. All of the interfaces are accessed via the PLCC pin connectors. 8MBytes of 100MHz SDRAM, and 512kBytes of FLASH ROM.